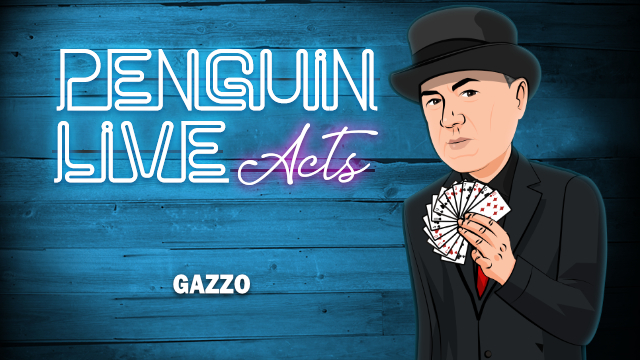 Today, when you order "Gazzo LIVE ACT", you'll instantly be emailed a Penguin Magic gift certificate. You can spend it on anything you like at Penguin, just like cash. Just complete your order as normal, and within seconds you'll get an email with your gift certificate. Gazzo LIVE ACT (Penguin LIVE) SUPPORT LIVE MAGIC. START LEARNING THE FULL ACT TODAY. "In all art and performance its the singer not the song and you are the best singer we have ever seen." -Penn of Penn & Teller. A 60 minute set of street magic performed on stage. Cups and Balls-a new loading technique. Gazzo is one of the most sought after professional entertainers in the world. Based in Bath Spa, England. 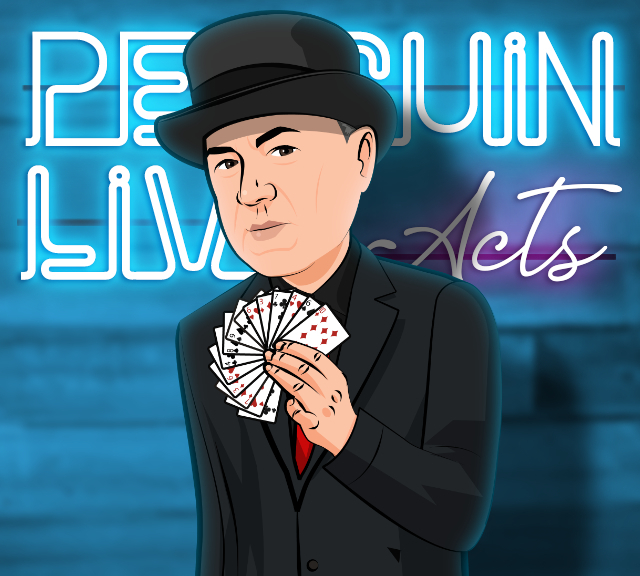 He has been mixing his comedy, magic, and charm for over 30 years into a must see show. He has travelled the world performing for all different types of people. He has graced stages across Canada, USA, UK, China, Dubai, Portugal, Spain, New Zealand, Australia, and all over Europe. Recently he was seen on Penn & Teller’s "Fool Us" on ITV to a great success. As well as being the author of numerous books and dvds in the magic industry; Gazzo performs weekly at his own venue in Bath called "Krowd Keepers Magic Theatre". Purchase this product and on April 7th anytime after 12:00pm Eastern, click the MyPenguinMagic area at the top of the Penguin site. You'll see the "learn" button appear next to this lecture. Gazzo is truly one of the greats. I have seen him perform many times and worked a few conventions with him; he is incredibly perceptive, From his choice of tricks to his choice of volunteers this lecture is a master class. Who else do you know that could do an hour, yes an hour, and only do three tricks? Don't pass this up, it is well worth the cost. You will learn a lot more than just "more tricks" (don't we already have enough?). You will learn philosophy and theory about creating a show and making it work under different circumstances. Save your money by not buying the latest gimmick, and spend it here. You will not be disappointed. Gazzo is one of the worlds greatest magicians. Check out his Wikipedia. In his career, he has performed more than fifty-four thousand shows to live audiences of over 15 million people and counting. He probably has performed more shows than anyone on the planet. 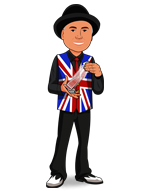 He has transcended to a place where he is not just a world class magician, just a world-class ENTERTAINER spanning several genres. His book Phantoms at the Card table co-authored with David Britland is cited by EVERY MAJOR contemporary mainstream book about magic check CHECK ‘Fooling Houdini’ by Alex Stone and more recently 'Magic is Dead' by Ian Frisch. His many students are creating waves of their own (anyone heard of Billy Kidd?). He is the ONLY student of Walter Irving Scott, who was cited by his contemporaries as the greatest living card man of his day. Gazzo has worked in pretty much every venue Cruise Ships, Restaurants, Theaters, and of course is widely known as one of the worlds greatest street entertainers. His theater Krowd Keepers located in Bath, England is as of this writing in 2019 rated the #1 thing to do in the city according to Trip Advisor. This is an astonishing feat for ANYONE in entertainment. Have you checked the reviews for headliners in Vegas. No one comes close. Gazzo has been featured on National Television, including Penn & Teller's "Fool Us." Al Pacino, Halle Barry, Carmen Diaz, Steven Spielberg, Manny Pacquiao, Roy Scheider are some of the of celebrity fans Gazzo has entertained. He just founded a Magic School called Know More Magic. I went to the first class and it was incredible. It is going to be so cool to see what Gazzo does next! Everyone always thinks of Gazzo as the worlds greatest street performer, who knew he also gave the worlds greatest indoor show too? A performance like this proves that you don’t need a thousand little tricks to make a show work. What a genius. One of the best magic videos you’ll ever see. This has truly inspired me to rethink the way I’ve gone about so much. this is a great dvd a good cup and ball routine, but the standout effect was the egg bag so much so that i straight away purchased 3 silicon eggs GREAT ROUTINE .do yourselves a favor and buy this download. If you want to do a street show or an engaging cabaret magic performance there are few people in the world, better than Gazzo. I first saw Gazzo when I was 12 and it was the most incredible show. What a gift to us all that he has decided to share this. Gazzo is off-the-charts amazing. He’s one of top 3 entertainers I’ve ever watched in my life. The other 2 aren’t even magicians. Gazzo could entertain you for a few hours without doing any magic whatsoever. When he adds magic to the mix it’s dynamite. I've watched the likes of Copperfield, Angel and Mac King but I'm telling you Gazzo has an edge over them as an entertainer. There is gold in this video. He goes over his brand new, never revealed before the act, step-by-step. I am incorporating his ambitious card routine into my act. It will take me some time to get it dialed in 100% but his guidance is going to save me years of developing my own material. Get this material right away. This is most likely biased: I first met Gonzo (yah Gazzo, I’ll always be a prick) at the last year Fechters was at The Forks. I was there the first day of this lecture but had to leave for a weekend gig, so missed the rest. What I saw in the first day was a.brilliant entertainer, who having obviously fought through every aspect of the learning curve that only street and so repetition and trial and error can provide, was able to answer every level of experience: gold for whatever level one had the means to plumb. Raw and unscripted. Worth it!! And you will gain different things from him each time you watch.